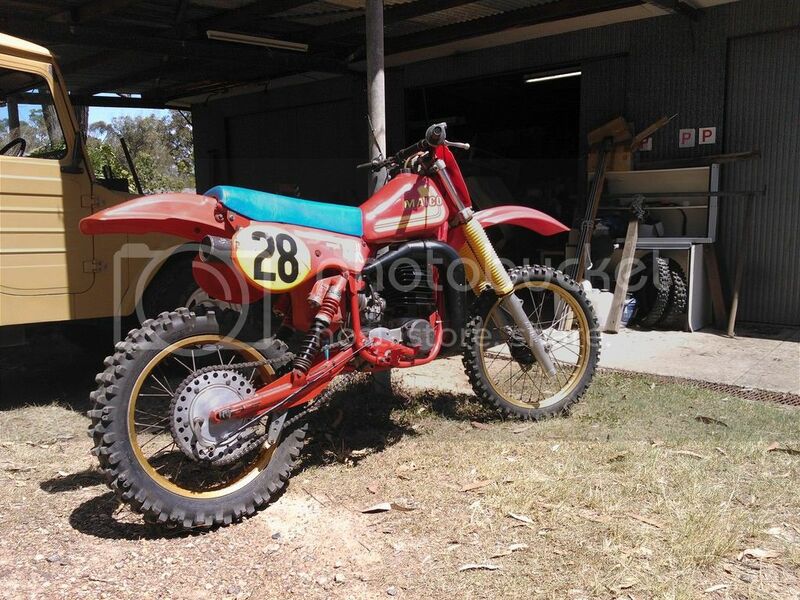 Maico 400 Mega 2, whats it worth. I've been thinking of selling my 81 400 Mega 2 but have no idea what it's worth. A few details about the bike. Frame is an 81 250 mx, motor 81 400 with GS ignition and 40mm Bing, also has just had a new sleeve and stock Mahle piston fitted as well as a new rod and main bearings. It has near new tyres fitted to original wheels with original gold rims, forks are original with good chrome, shocks are Marzocchi and work quite well. So I'd describe the bike as very original ready to race bike but it is not a bling covered show bike. I'll try and post a couple of photos from Google. Re: Maico 400 Mega 2, whats it worth. bang her on ebay with a low reserve and watch and wait. unless you have a must recover figure, its the true way to work out what its worth ATM. clever people deliberately put an error in the text so they can "pull" the sale just before it ends "to be fair to everyone.." if they havent got enough $$ or are testing the value before selling to a mate. or they relist for a longer exposure. nothing opens a wallet quicker than a desired item disappearing in front of your eyes only to reappear again.. i saw a bloke relist a HK monaro 5 times trying to get the magic 100K. it got to 99 on its first appearance. 99.2 on its second and then the buyer must have got the sh*ts as it went down hill after that. its last attempt was 84k and was pulled 24 hrs before auction end and i havent seen it relisted (could have sold off ebay i guess). there are a million maico groups on facebook but most of those guys are the buy it low and fix it guys (like here) you need to find a cashed up boomer who always wanted a Maico when he had a ts 185. i wont put on a figure as i have no idea what maico's are worth but my range guess would be 3 - 6 k depending on how important originality is. good luck!.. The bike can not be called original because it was a 250 MX. Have you still got that motor? A 490 will always be worth more. A 250 MX is worth about 5 to 6 thousand so work from there. Also as the motor is a GS it is also worth less, in my opinion. The GS has a higher ratio 5th gear and final drive gear. I only said it's original as there is not any of those horrible billet parts on it. But no the motor is not the original for that frame. No do not have the 250 motor. The ignition is the only GS part on the bike as it makes for a smoother easier to start motor. What happens when you click the link? Maybe there is a setting to share them or something. I have used Photobucket in the past but it has gone commercial. I could Email them if you PM me an address. I just tried to look at the photos after logging out of google and can't see them. Any other photo sharing thing around that work? Managed to get photo bucket to work. If the motor is a GS the gearing will be different too. The fifth gear that also runs on the shaft that the front sprocket is on is a different ratio. I know I changed the gearbox on a 490 from a GS to a MX one by changing the Counter Shaft and the two fifth gear, gears. The dilemma is to try and sell or not. Always nice to get so money for a rainy day.